It’s summer, and suddenly the list of things to do is longer than the liquor store queue on a Friday after work. Everyone has somewhere to be and something to see, and they all want to get there 10 minutes ago. Hit the brakes, please, as it’s also construction season. And although Alaskans take their recreation seri­ously, the people who wo6rk on road improvement projects across the state also take their jobs seriously. They want to live, and they need drivers to be mindful that speeding and distracted driving in work zones can result in crashes and could put the lives of the road crew in danger. 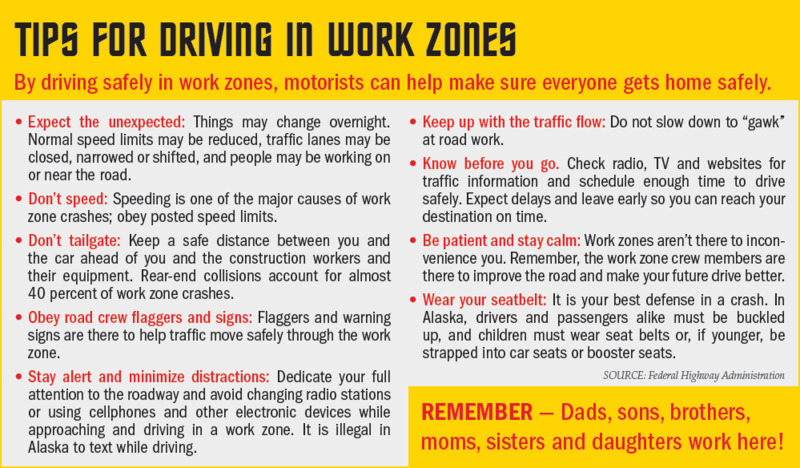 Each year, the Federal Highway Administration recognizes Work Zone Awareness Week in April. It’s a time to raise awareness that changes to daily traffic patterns in work areas, as well as narrowed rights-of-way and other construction activities, can lead to crashes for drivers who aren’t vigilant. This year the event was held April 9-13. “Work zone incidents impact everyone. In addition to vehicular crashes and fatalities, the leading causes of death in the road and bridge construction sector are run-overs, back-overs and falls. Simply put: Drivers, passengers and construction workers are all at risk. Your driving habits can directly help — or harm — the well-being of other motorists, cyclists, workers and pedestrians, including you,” the FHA Work Zone Safety website states. The theme of the 2018 Work Zone Safety awareness week was: “Work zone safety is everybody’s responsi­bility.” Drivers, cyclists, motorcyclists and pedestrians should always be alert, obey traffic laws and signs, and pay attention to their surroundings. Passengers should always buckle up, act responsibly and avoid distracting the driver. Field workers must always implement best safety practices when actively working in construc­tion zones. Emergency responders must be able to respond and secure crash locations. Police and courts are responsible for enforcing traffic and work zone laws, and local and state governments should promote safe roads and increase public awareness about work zone safety. Everyone has a role to play in keeping work zones as safe as possible. In Alaska, road construction will be happening from Ketchikan to the Dalton Highway and many places in between, with the bulk of the project list happening in Southcen­tral Alaska. Anchorage will see 11 projects, including the ongoing Glenn Highway and Muldoon Road inter­change project and a project to widen Abbott Road between Jupiter and Birch roads, along with several resur­facing projects. Glenn Highway commuters will see a resurfacing project between Eklutna and the Parks Highway and the start of a project to widen and add frontage roads to the Glenn Highway near Palmer between S. Inner Springer Loop and W. Arctic Avenue. Parks Highway drivers will see reconstruction between Church Road and Pittman, where the highway is being upgraded to four lanes with improved frontage roads and a rebuilt pedestrian path. North of Willow, Parks Highway drivers will encounter two projects between Mile 83 and 123.5. The first will result in four passing lanes in that area and the second will rehabilitate the highway between Mile 90 and 99, widening shoulders, adding rumble strips and more. Knik Goose Bay Road will see delays as well, due to a project to realign Fairview Loop to connect to the road. Fishing in Kenai? The Seward Highway will see significant upgrades and bridge replacements between Mile 75 and 90. The Sterling Highway has several projects slated to widen shoulders and improve approaches and other features (Mile 97 to 118), add left turn lanes (Mile 89.8) and rehabilitate the road and add passing lanes (Mile 58-79). The National Highway Traffic Safety Administration’s 2015 and 2016 annual reports on fatalities show a disturbing upward trend in work zone fatalities. In 2015, the NHTSA work zone fatality report showed 712 fatalities, 595 from drivers and passengers, 113 from pedestrians and bicyclists and four from occupants of non-motor vehicle transport devices or people on personal conveyances. In 2016, those numbers increased across the board, to 765 total fatalities, 635 of which were from drivers and passen­gers, 125 of which were pedestrians or bicyclists and five of which were in the “Other” category. The U.S. Department of Labor, Bureau of Labor Statistics, in its annual Census of Fatal Occupational Injuries, also reported an increase. In 2015, 130 worker fatalities in construction sites were reported. That number rose to 143 in 2016. The Census logged 177 fatal work zone crashes involving large trucks and buses in 2015, 186 in 2016. And in 2015 the Census logged 187 work zone fatal crashes in which speeding was a factor. The number jumped to 190 in 2016. The bottom line: Everyone needs to pay attention and obey the laws in work zones. Not doing so can cost lives. No fishing trip is worth that risk. Know before you go. Check phone apps, agency websites and the radio for the latest traffic information to ensure a safe and timely trip. Wear your seatbelt. It’s your best defense in a crash. Expect the unexpected. Work zones change often. An area you drove through yesterday may look different today. Avoid distractions. Distracted driving in work zones can have deadly consequences. Put down your phone, and keep your eyes on the road. Don’t speed or tailgate. Keep a safe distance from the vehicle ahead of you, and don’t speed. Tailgating and speeding lead to crashes with other vehicles and field workers. The Alaska Department of Trans­portation & Public Works posts weekly updates of construction areas and how drivers will be affected at www.alaskanavigator.org. The Alaska 511 system provides information on statewide road condi­tions including road closures, emer­gency and weather alerts. Call 511 or go to 511.alaska.gov, @alaska511 on Twitter or www.facebook.com/ Alaska511. The Associated General Contrac­tors of Alaska urge all motorists to stay vigilant, slow down and exercise caution when driving through work zones, and obey signs and flaggers’ instructions. Everyone on the road shares responsibility for keeping work zones safe — motorists, bicyclists, pedestrians and construction workers alike.